He might have been a flake, but he was a smart and talented flake. I’m not sure how Pacers general manager Mike Storen knew to draft the forward from Drake in the second round of the first ABA draft. Maybe it was just dumb luck. It’s not like the Pacers had a scouting staff just a few months after the league was formed. They didn’t even have a coach at the time of the draft. But it worked out, because Netolicky became a four-time ABA All-Star and member of two of the Pacers’ three championship teams. So many great athletes come from difficult circumstances, or at least middle-class backgrounds. Not Neto. His dad was a brain surgeon in Iowa, so he grew up rich. He was more interested in tending to his exotic pets, such as a lion and an ocelot, than bothering with basketball, at least until his senior year in high school. After attending a junior college, he enrolled at Drake and began serious development of his game — as serious as he was able to be about anything, at least. 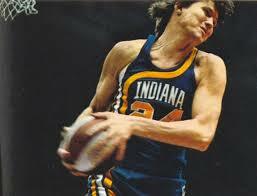 Following the ABA and NBA drafts, he flew to Indianapolis in a rented plane and signed with the Pacers, rather than San Diego of the NBA. He was an All-Star that first season, and wound up being Slick Leonard’s whipping boy for a few years after that. He took some nights off, so Slick yelled at him, threatened him, even grabbed a hockey stick in a locker room in Minnesota on one occasion and acted like he was going to hit him over the head with it. It was all for love, though. Slick traded him away after the ’72 championship, but later brought him back for a few seasons. He mostly played off the bench after that. He owned a bar for awhile, Neto’s, in the Meadows Shopping Center, where Pacers and opposing players gathered. There are some great stories from there, such as the one we mention about the player who danced and got romantic with a woman, only to find out “she” wasn’t a woman after all. Neto fell into his niche after the Pacers traded for Mel Daniels, moving Neto to forward instead of center. Those two became the best of friends, and still are to this day. It’s a yin and yang thing, opposites attracting, the bully and the class clown coming together. All in all, Neto produced a lot for the Pacers, averaging about 18 points over his first five seasons. His high IQ allowed him to pick up elements of the game quickly. He once told me he learned more about basketball from guarding Connie Hawkins in one game than from a season of college basketball. He had a great mid-range jumper and a deadly hook shot, and ran and jumped well, too. He could play, in other words. On and off the court, actually.